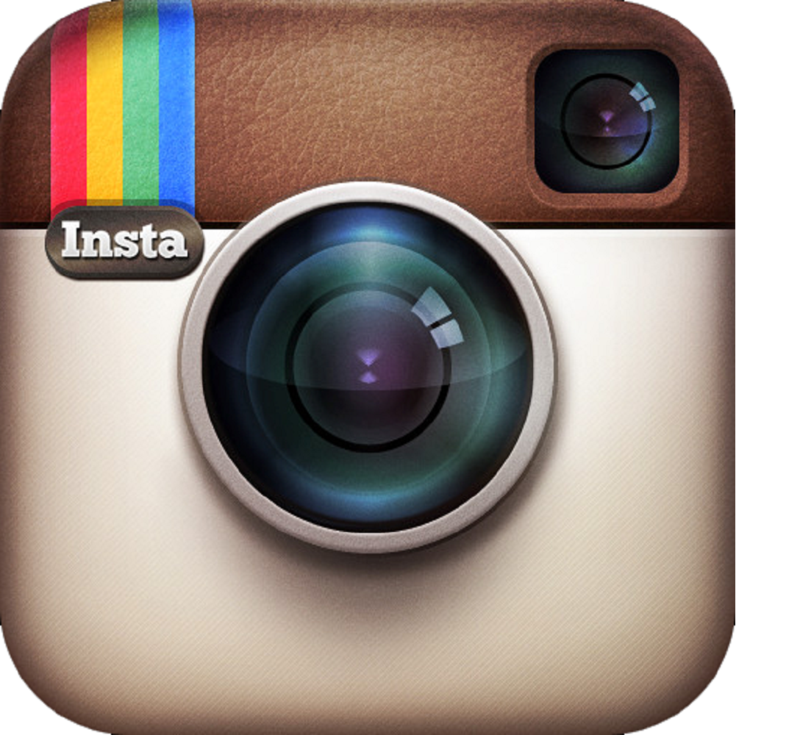 One thing I love to do is to show off great cars, so what better way to show off the best photos of my Instagram feed for May 29th 2014... well the automotive ones anyway. I doubt you want to see a bunch of fitness ones. In case you like what you see, I included the instagram handle of each account that I'm about to show off, and also, don't forget to follow me (@CarShowBernie) as well. First things first, if you are in the Dallas area or if you are willing to drive to Dallas, Dub Magazine Car Show (@DubShowTour) will be stopping in Dallas this Sunday. I'm very critical of car shows, however, this sounds like a promiscing show. Dallas is a great city to have a car show in, and one day, I will make it there. P.S. The Dub Show isn't coming to Houston, so if you live in Texas in general, you'se might want to throw some snacks in the car and head to Dallas. And how does K Michelle fit into performing at a car show? Before you say that Dallas is too far, Topo (@wide_body_king) will be at the Dub Show in Dallas, and he's bringing what's in this video. Oddly enough, I failed to mention that Topo is traveling from Los Angeles to come to the show. 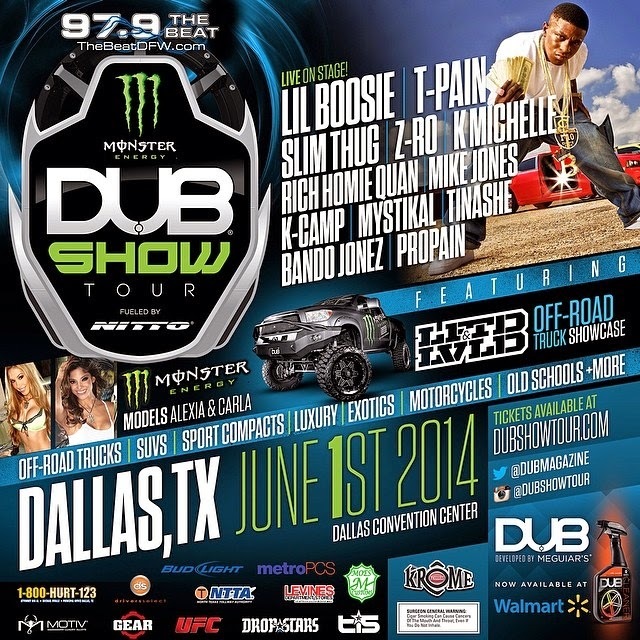 I'm definitely sure that Trendsetters Dallas (@Trendsetters214) will be attending the Dub Show in Dallas. And if they bring vehicles like this Chevy Camaro SS, then Trendsetters will have a very busy area within the show. 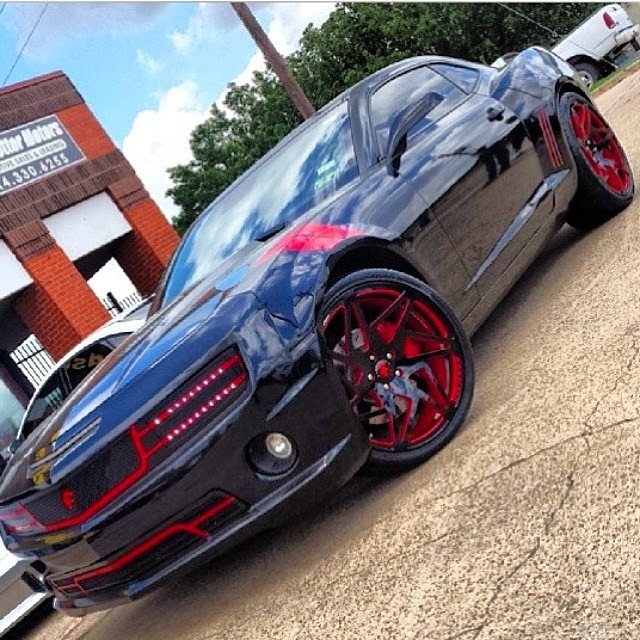 This particular Camaro SS is black with red accents, with 22 inch Forgiato Wheels and Forgiato Grille. It also has a custom sound system. Orlando's Own, Ultimate Auto (@ultimateauto) released a teaser picture of an Army Green Ultimate Edition Jeep Unlimited. This next person isn't an automotive person, in fact, he's admitted to currently driving a 2004 Cadillac Escalade that burns oil faster than usual. One of the guys from Guy Code and also from my FAVORITE morning show-The Breakfast Club, Charlamagne tha God (@CthaGod) posted this. 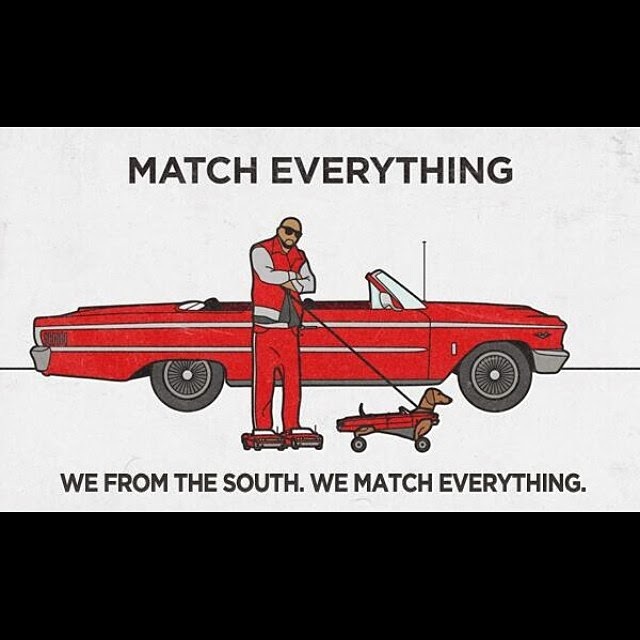 Personally, I've lived in the South for awhile, in fact a little too long, and one of the things I learned is that guys will match their clothing to their car. P.S. Don't listen to the Breakfast Club if you have kids in the car. From my hometown of Long Island, New York, Martino Auto Concepts (@martinoautoconcepts) showed off a progress photo of a display table that they're making for one of their customers. 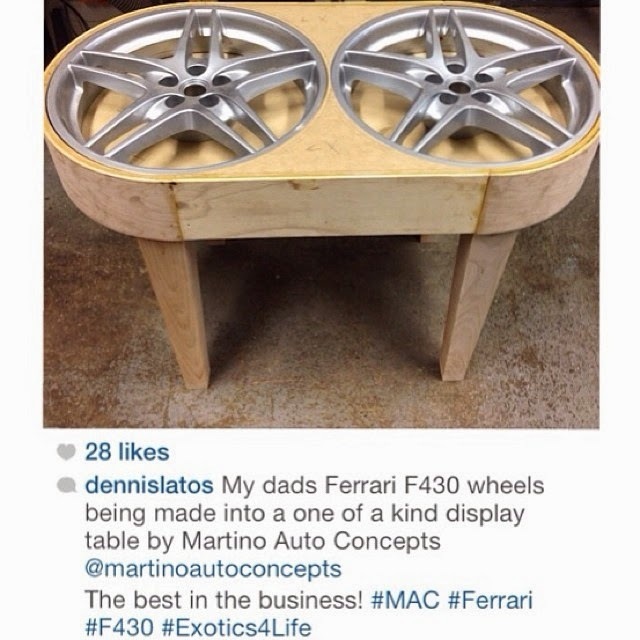 Combining authentic Ferrari F430 Wheels into furniture is perfect for an automotive enthusiast. 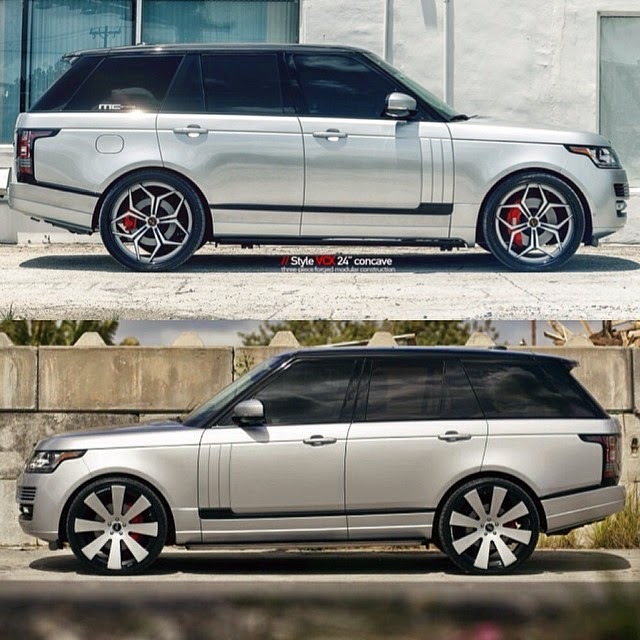 Mc Customs (@MCCustomsMiami) wants to know if you like the Range Rover with Forgiato Wheels or the Range Rover with Vellano Wheels. I like the Range Rover with the.... Like I was gonna answer that question. Lexani Wheels (@Lexaniofficial) has officially topped the whole conversion vehicle idea. They can customize a vehicle to have a toilet. 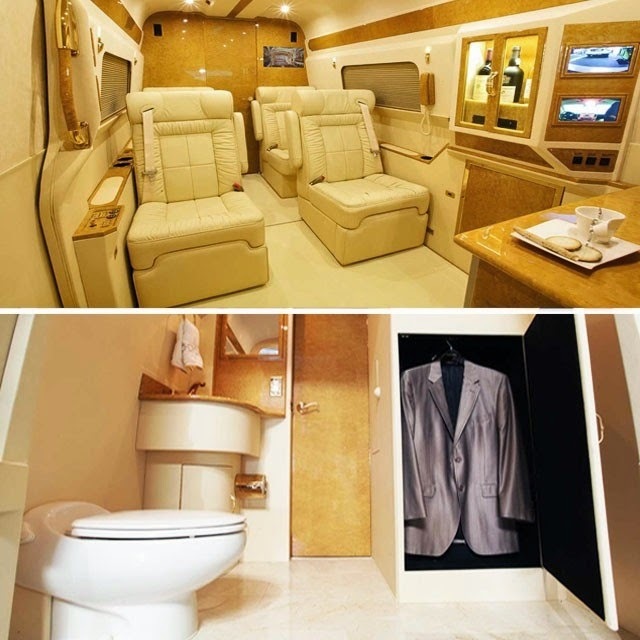 This is a Mercedes Benz L5B Sprinter Conversion van with a toilet. 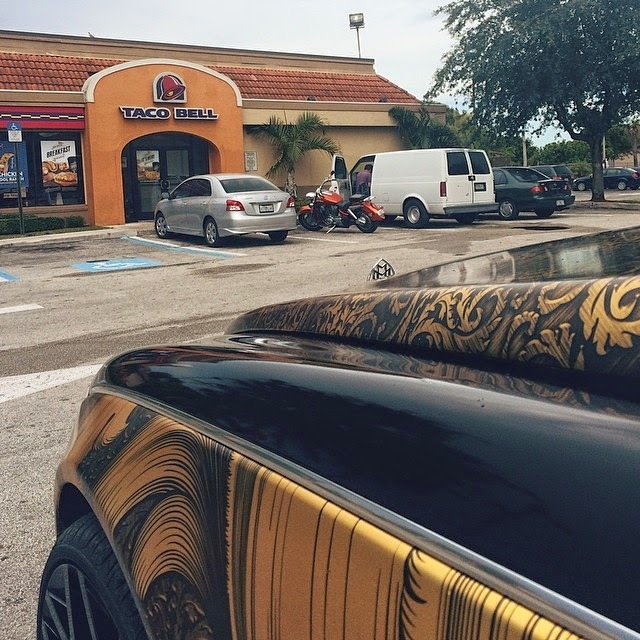 Everyone's favorite photographer, (@Derick_G) really pulled up to a Taco Bell in a black and gold wrapped Maybach. Of all the fast food places, he really picked Taco Bell. That's like picking White Castle. And if you're from the northeast, you know what effect that White Castle has on a person. If you're not sure what I'm referring to, let's just say that the added feature in the Lexani Conversion van would be put to some use, and you'll be on it for awhile.